The New York Road Runners (NYRR) hosted a plethora of events in all five New York City boroughs leading up to and on Global Running Day as part of their efforts to promote running and activity. One of the events was a Guinness World Record attempt for most people in a treadmill relay. “Our mission is to help and inspire people through running so we think Global Running Day is a great opportunity once a year to really celebrate what we do every day which is getting people moving and running to be healthy and fit,” NYRR president and CEO Michael Capiraso said. The event, which began 8 a.m. June 6 and lasted 36 consecutive hours, featured 250 participants from local running clubs, professional athletes, media personalities — including yours truly and music editor Ryan Kristobak running at 12:30 a.m. — and more. 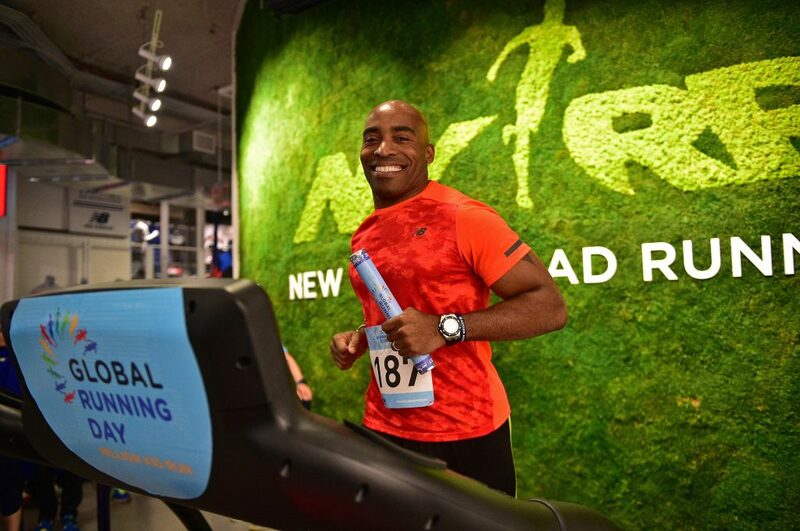 “It’s a great feeling to be in New York celebrating Global Running Day,” said four-time Olympian and 2009 NYC Marathon winner Meb Keflezighi. With sand beneath her feet and volleyball in her hand, April Ross surveys the scene. While the two-time Olympic medalist is more focused on where to place her next serve, New York City's skyline, including the massive One World Trade Center, dominates the landscape and the Hudson River complements it in this unique professional beach volleyball event.